4.8 stars from 7526 reviews. Minis: up to 0.5" x 1.0"
What is an Asset Tag? Please mention when you call. Outside these hours, please email. Email : Write to us. 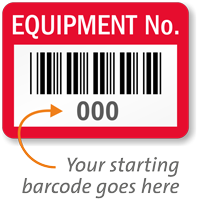 Mark your equipments serially with these Equipment Number Barcode Asset Labels. 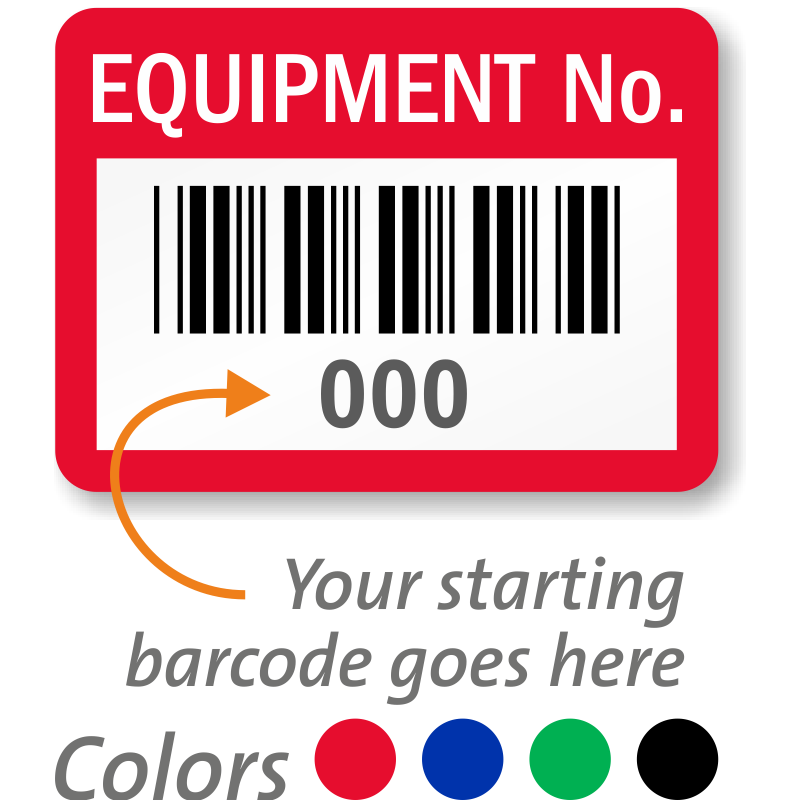 All you need to do is choose a color and three digit starting number from the drop down box. Premium vinyl with an aggressive adhesive. Sticks to smooth metal and most plastic surfaces. Conformable – for curved surfaces. 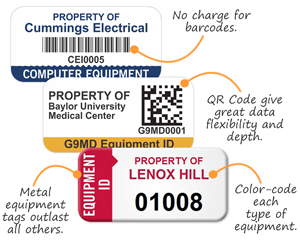 Not laminated – but labels are still easy to wipe down. Durable, 4 mil thick vinyl. Write on labels with a marker. Low cost aluminum foil tag. Works well on metal or many smooth, plastic surfaces. 2 mil thick annealed aluminum is conformable for curved areas. Great for light-duty applications. Although printed on the surface, these tags wipe down easily. Print can be scratched with a scuffing. 9.9 mil brushed silver metallic polyester labels. Strong acrylic adhesive with a peel-off liner. Wipe off dirt, grease, or water from surface. Digitally printed, in full color. 3 mil thick destructible white vinyl. Breaks into tiny pieces upon removal. Thwart vandals. Aggressive adhesive sticks well metal and most plastic surfaces.